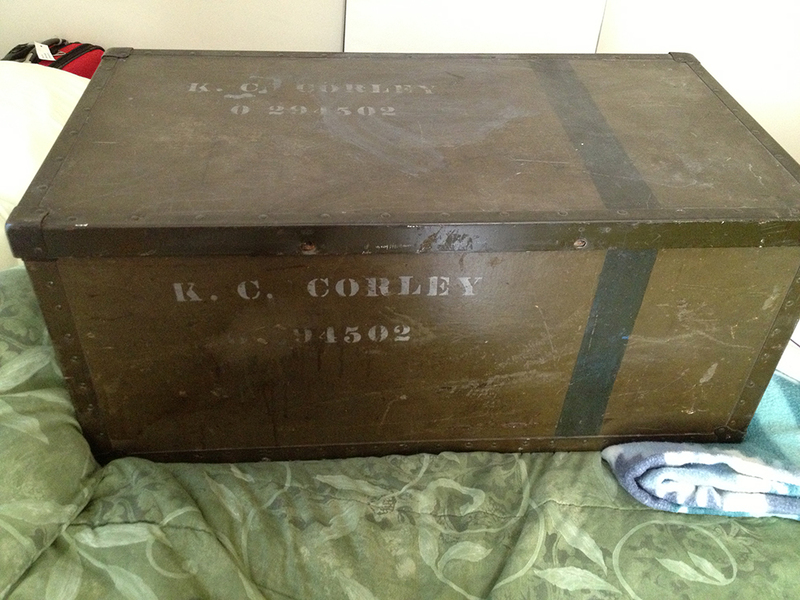 Last weekend, I drove down to Richmond, Va., to retrieve two trunks that once belonged to my dad when he was an officer in the Army Reserves. My half-brother had them and gave me one to keep for myself and one to give to my sister. They are really pretty awesome connections to my dad’s military past. They are stamped with the same ID number that was printed on his dog tags. The smaller of the two trunks. The top of the larger trunk. The trunks can nest together and are part of a larger set of 7(!) that has been split up among family members. Apparently, Dad traveled with all seven at the same time while stationed around the world. I never want to hear anyone complain again about how much I pack for a trip. 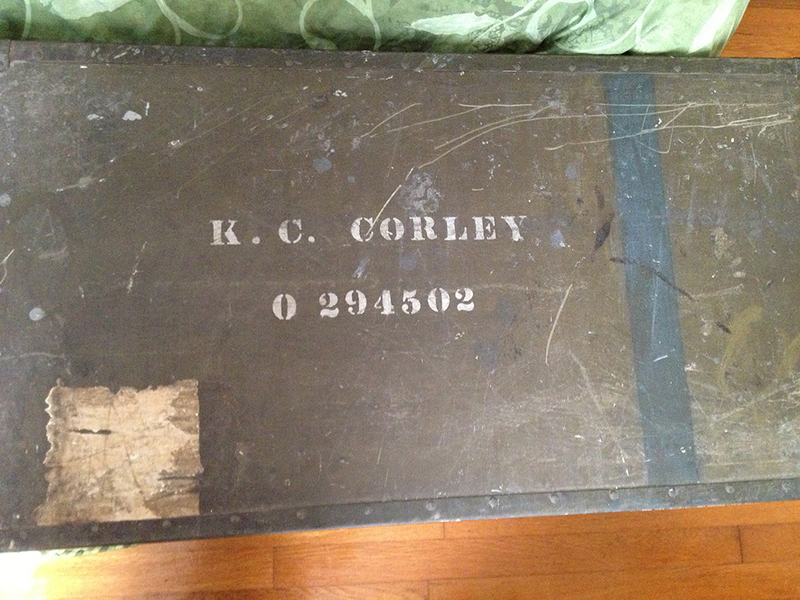 I apparently get my preparedness from my dad. Note: I’m assuming the blue line on the trunks indicates something — either rank or branch of service. Anyone know? Dear Reader: Do you think you are related to the individuals listed in this post? Please drop me a note! I love hearing from cousins and others researching my family! One of my 4th great grandfathers was Obediah Basham, who was born on April 7 in 1760 (or 1758, according to some records) in Cumberland County, Virginia. He was a Revolutionary War soldier and there is a lengthy pension file about him (I still need to transcribe it). Numerous folks have used him as entree into the DAR. 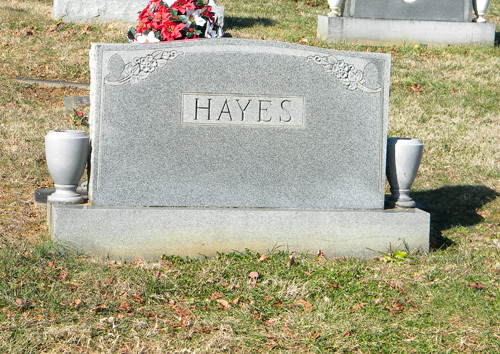 He has a FindaGrave page, but no photo of his gravestone in Kentucky (his wife’s is available and it is crudely engraved). Obediah’s daughter Delilah married into the Corley family. 1) Determine where your ancestral families were on 1 January 1913 – 100 years ago. 2) List them, their family members, their birth years, and their residence location (as close as possible). Do you have a photograph of their residence from about that time, and does the residence still exist? 3) Tell us all about it in your own blog post, in a comment to this post, or in a Facebook Status or Google+ Stream post. I was relatively certain that my dad and his family were living in Washington, D.C., but I was missing their 1910 census records. I knew they were living on Columbia Road in 1920. My grandparents were married in 1905 in Philadelphia and then my father was born in 1906 in Washington, D.C. I wasn’t certain where the family was living in 1910, but I was pretty sure they were in Washington. I knew a good place to start would be to try and find their 1920 neighbors in the 1910 census. I’ve had success with this method before. I struck out with the first two families that I tried, but I hit paydirt on the third attempt. My dad and his parents were living next door to a Mr. Story B. Ladd and his family in 1920. I found the Ladds again in 1910, still on Columbia Road. My ancestors were their neighbors then too, but their name was mistranscribed as Cortey, which is why they hadn’t turned up in previous census searches. I’ve since submitted a correction to Ancestry and saved the record to my father and grandparents. Yay! Given that the census records show that the family was at the same address in 1910 and 1920, I can say that’s probably where they were on January 1, 1913. I’m less certain when it comes to my great-grandfather on my mother’s side, William Edmond Hayes. His family was originally from Carter County, Tennessee. In 1910, however, Willie and his parents were in Umatilla County, Oregon, in what appears to have been a failed attempt to make a better living. In 1914, Willie is back in Tennessee, marrying my great-grandmother. And he wasn’t the only one to return — every single member of his family was back in Carter County again by 1920. I’m still unclear as to the exact details about what the Hayeses were doing in Oregon, but I think they were trying to operate an orchard. I have found records that indicate that they went into debt regarding such a venture. The fact that the entire family returned to Tennessee leads me to believe that it didn’t work out, although I need to do more digging to find out the whole story. Given the information I have so far, I can’t say for sure whether the Hayses were still in Oregon or back in Tennessee again by January 1. 2013. Most of my other ancestors were where I expected them to be — elsewhere in Carter County, Tennessee, or in San Antonio, Texas. It’s dinner time now, otherwise I would go into more detail here. Thanks, Randy, for prompting me to find that missing census record! Tagged census, Corley, Family, father, grandfather, great-grandfather, great-grandmother, records, research, Tennessee, Washington D.C.
As a blogger, I’m obsessed with site metrics and as a researcher/librarian, I’m obsessed with search terms. WordPress satisfies both obsessions with its blog statistics, which let me know how people find my blog by searching the Internet. I found several interesting search terms over the past week (for still more search-term hilarity, I suggest you visit my friend Amy’s We Tree blog for her “Fun with Search Terms” posts). 1943 guide to hiring women — perhaps this week’s “Binders Full of Women” meme made you think of this brochure that informed 1940s government managers about the ins and outs of hiring and employing women. andrew jackson photos — unfortunately, Andrew Jackson died in 1845, pre-dating most photographic technology. My second great grand uncle Andrew Jackson Corley, on the other hand, lived in the late 1800s, and I was lucky to come across a photo of him. how to flip my couch into a flatbed — I think the method you use will be determined by the type of couch you have (Hopefully you have a sleeper sofa. Otherwise, I’m not sure how successful you’ll be). You found my blog because of my post about my Flip-pal scanner — one of my best purchases of 2012. I highly recommend you get one too. You can use it while on your couch or while on your bed. roots tech 2012, going to — RootsTech 2012 was back in February, but you’re in luck! The event will take place again in March 2013. Hope to see you there. why are maganetic albums bad — Magnetic albums are bad. Really, really bad. I highly recommend using an acid-free album like these from Creative Memories (I am a CM consultant) to better protect your photos. “alfred t. gourley” civil war — nice use of quotation marks to create a phrase out of the name. Unfortunately, even though you most likely also are a descendant of my third great-grandfather, you didn’t reach out (and I even have a special request at the top of this post asking for you to make contact). Next time, stop by and say hello! I don’t bite. abbey mausoleum arlington wiki — It would be great if there were a wiki for this now-defunct mausoleum, which was looted over many years of neglect. I posted about my search for ancestors who used to be buried there. Hopefully you also found this FindaGrave page about Arlington Abbey, including old pictures of the facility. Determine what is your longest unbroken line of ancestral gravestones – how many generations can you go back in time? Do you have photographs of them? Unfortunately, I can’t go back too terribly far in terms of my own family’s gravestones. I do have a photo of my dad’s gravestone (though I won’t post it for privacy reasons) and I’ve posted about my search for his parents’ and grandparents’ stone. 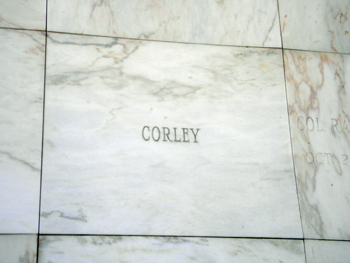 The photo trail goes cold in terms of the next generation of Corleys — Benjamin William Franklin Corley and his wife Lois (Wakefield) Corley (though I know them to be buried in Tower Hill Cemetery in Shelby County, Illinois; I’ve requested photos of their graves). On my dad’s maternal side, I did have the luck of finding his grandparents at Laurel Hill in Philadelphia. The cemetery sent me a photo of a headstone listing my great-grandparents William B. Hill and his wife Martha (Simpson), but it is copyrighted. When my mom died, she wished for her ashes to be scattered in the garden of her church. There is no marker. If I were to skip to the next generation, I do have a photo of my maternal grandparents grave (again, not posting for privacy reasons). Just a couple of years ago, I finally got to visit the grave of my great-grandparents, Della Crow and William Hayes. I haven’t found a photo of the grave of William’s father, Joseph (but this post spurred me to request one via FindaGrave). I haven’t found death information for his mother yet. Likewise, I haven’t had much luck finding stones for Della’s parents. 2) Use your pedigree charts or your family tree genealogy software program to find the person with that number in your ancestral name list (some people call it an “ahnentafel”). Who is that person, and what are his/her vital information? 4) Write about it in a blog post on your own blog, in a Facebook status or a Google Stream post, or as a comment on this blog post. 5) If you do not have a person’s name for your “roulette number” then spin the wheel again – pick a great-grandmother, a grandparent, a parent, a favorite aunt or cousin, yourself, or even your children! It took me a while to find an ancestor whose birth year, divided by 50, matched a number on my Ahnentafel chart that I had filled in. So, I started with Richard Corley, my 7th great-grandfather. He was born in 1670, which led to a roulette number of 33 (most of the rest of the 30s on my Ahnentafel chart are not filled in, sadly). 1) Her name is one of my favorites among my ancestors. Delilah was the downfall of Samson in the Bible. These days, she’s the subject of a hit song by the Plain White Ts. I’m fascinated that her parents chose that name for her. Her father’s name was Obediah, one of my other favorite names among my ancestors. 2) She was born in 1785 in Bedford, Va., according to the preponderance of secondary sources I’ve been able to find. This area of Virginia has very few surviving original records due to fires at county courthouses and other repositories (and not all were due to the Civil War either). 3) She married Jonathan Cheatham Corley and together they had 13 children, including my 2nd great-grandfather, Benjamin William Franklin Corley, and his twin brother, Henry William Washington Corley. Delilah and Jonathan are buried together in a Corley family cemetery in Shelby, Ill.
My fifth great-grandfather, Valentine Corley, passed away this day in 1803 at the age of 82. Before writing this post, I didn’t have any direct sources of information about him. His death date came from the Family Data Collection on Ancestry, which also lists his wife as Sarah Walker. Valentine lived and died in Virginia. In preparation for this post however, I did another search for records for Valentine and found another Ancestry member posted scans and a transcription of Valentine’s will. The will verifies that his wife’s name was Sarah and also reveals that they owned several slaves by the names of Betty, Ruth, David, Sarah, Lucy, Fanny, Pleasant, Wiat, Daniel and Rob. The names of Valentine’s children also appear: Aggathy, Ann, Mary, Milly, Asa, Caniel (my 4th great-grandfather) and William.